John Ritter was an American actor who was probably best known for his role as Jack Tripper in the television sitcom Three's Company. He won both an Emmy and a Golden Globe award in 1984 for his role on the show. 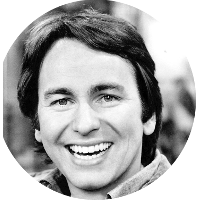 John Ritter died tragically in 2003 from an aortic dissection shortly after production of an episode for his sitcom 8 Simple Rules for Dating My Teenage Daughter. He was the son of famous singing cowboy Tex Ritter. In addition to his father Tex Ritter, some of John Ritter's closest famous kin are former U.S. Presidents. These include Abraham Lincoln, George W. Bush, and William Howard Taft. He also has kinship to a couple of fellow celebrities, actress Raquel Welch and singer/songwriter Grace Slick. Other famous kin include aviation pioneer Amelia Earhart, women's rights advocate Susan B. Anthony, and cowboy hat inventor John Batterson Stetson.